Based on the malware’s name it is quite likely, Littlefinger Ransomware was created by hackers who like Game of Thrones. If you have seen the series or read the books and know how deceitful the character the malicious program was named after is; you should realize so could be the hackers behind this threat as they probably adore this character. What we have in mind is the infection’s developers might promise send a decryption tool to unlock the files encrypted by Littlefinger Ransomware after the user pays a ransom, but in reality there are no guarantees they will hold on to their word. 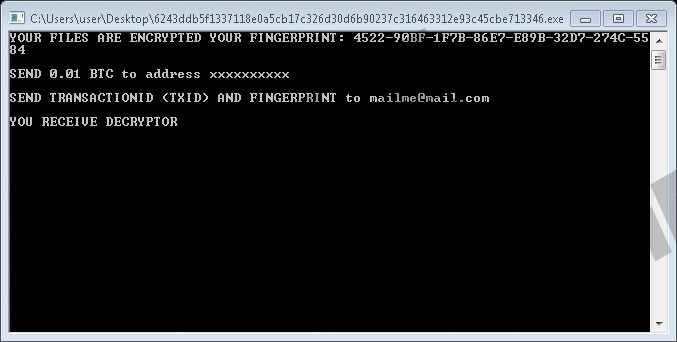 Therefore, if you encountered this threat and you do not want to risk your money, we would advise erasing the malware. Later, the files could be restored from backup copies provided the user has any. To learn how to get rid of the infection manually, we encourage you to see the instructions located at the end of this article. In the remaining text, we would like to talk more about the malicious program’s working manner. However, before we start, we realize it might be useful to learn how threats like Littlefinger Ransomware are distributed, especially for inexperienced users who are encountering ransomware for the first time. In many cases, hackers spread such infections via malicious Spam emails, harmful web pages, suspicious pop-ups, and so on. Clearly, there are quite a few ways the malware could enter the system, although all of the mentioned situations require the user to be careless. In other words, if you are careful enough not to open potentially dangerous data or visit sites that could be malicious, you might avoid such threats. The problem is opening infected files might be only one of the ways to receive a ransomware application. As you see, some hackers look for particular vulnerabilities they could exploit in targeted computers and if they succeed they may drop and launch threats like Littlefinger Ransomware without the user’s help. This is why it is same important to keep your software up to date, upgrade weak passwords, etc. Furthermore, if the malicious program manages to enter the computer it could start encrypting user’s files right away. Our researchers say it is so because the malware does not need to create any new data, which means it works right from the directory it was launched and from the moment it happens. Another thing we learned is Littlefinger Ransomware might target user’s personal files that have the following extensions: .jpg, .gif, .pdf, .png, .nef, .zip, .rar, .tar, .gz, .cs, .vb, .java, .class, .js, .vbs, .csc, .json, .txt, .c, .cpp, .h, .config, .py, .r, .xaml, .jsp, .php, .doc, .docx, .xls, .xlsx, .ppt, .pptx, .mp3, .mp4, .avi, .mpeg, .pst, .msg, .eml, .dbx, .mbx, .wab. There are infections that affect much more different files types, but based on the list it looks like the malware can encrypt most of the main private files, such as pictures, photos, text document, archives, and so on. The truth is the user might not notice difference between files that were encrypting and the ones left unaffected without launching them. To be more particular, Littlefinger Ransomware does not mark them by placing additional extension like some other threts do. Still, if you try to open encrypted data the fact it cannot be launched can no doubt mean only one. After encrypting user’s files, the malware might also drop a ransom note asking to pay a ransom and contact the malicious program’s developers. The strange part is even though the note says how much the user should pay it does not provide information where to transfer the money. It might be a mistake, or the hackers may expect users to contact them via email. As we already said at the beginning of the text, we would not advise writing to them or paying the ransom since there is a possibility you could end up being tricked. Thus, if you would not like it, we encourage you to delete Littlefinger Ransomware while following the instructions available at the end of this text or using a reliable antimalware tool of your choice. Check if the malware left any ransom notes. Quick & tested solution for Littlefinger Ransomware removal.